This season, bath your skin in the blissful softness with dark grey sweater from United Colors Of Benetton. Weaved with finest yarns, this cotton regular-fit sweater will be soft against your skin and will give an edge to your personality. 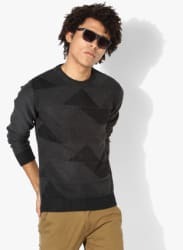 Look smart no matter what you wear it with this eye-catching sweater.